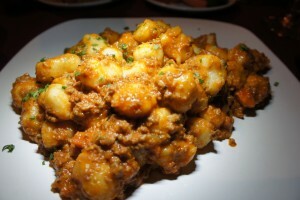 One step inside Café Gabbiano, and you know this is not your typical Italian restaurant. Yes, it does serve classic Italian cuisine, and yes, there are some vines and empty wine bottles as part of the décor. 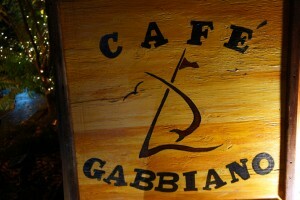 However, Café Gabbiano is more. A longstanding casual Italian restaurant on Siesta Key, Café Gabbiano became a fixture on the island. Originally owned and operated by Chef Pietro Migliaccio, the restaurant changed hands a little more than a year ago. Now owned and operated by Marc Grimaud and business partner Peter Tracy, Café Gabbiano is a casual, yet upscale Italian trattoria. With indoor and outdoor seating, space for private parties and a cozy dining room, this large space has a warm, quiet and refined feel. It’s the type of place where diners could be dressed in shorts or a little black dress – casually upscale. With an emphasis on wine, Café Gabbiano’s dining experience becomes more than just a meal. With more than 200 wine selections, the staff is always ready to help select the perfect food and wine pairing. In addition to the extensive wine list, there are ample choices on the dinner menu as well. 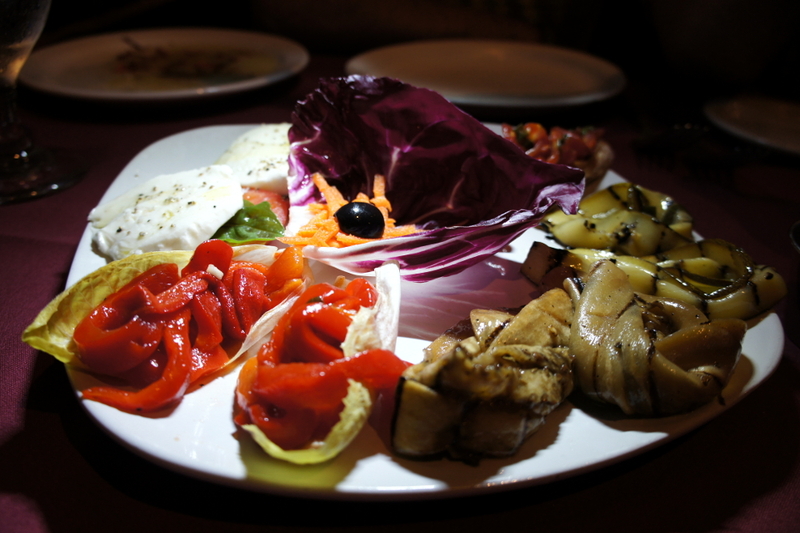 With a wide selection of salads, appetizers, meat, seafood and pastas, making a singular choice from the dinner menu is a challenge. Such a great combination of fresh crisp, salty, tangy and sweet. A very colorful presentation of marinated vegetables – tasty. A great combination of fresh seafood; refreshing and tastes like summer. 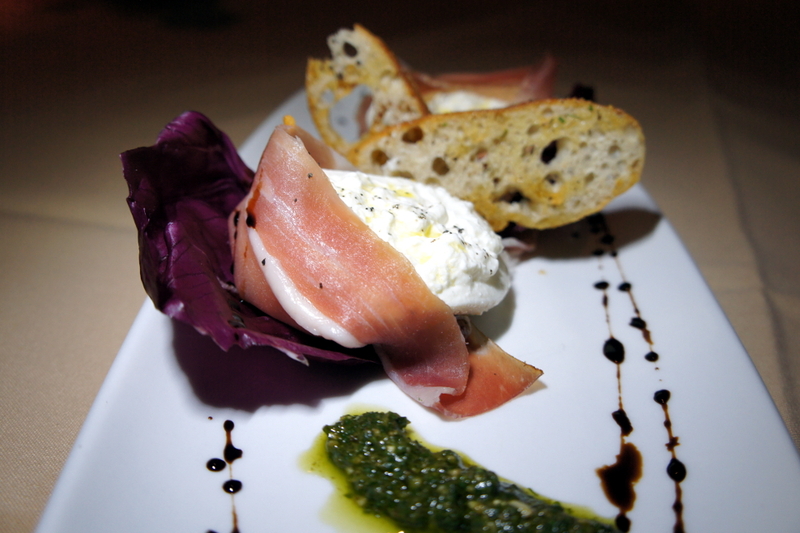 Full disclosure: burrata is definitely one of my favorites. It’s sweet, creamy and a great contrast to the slightly salty, smoky speck. Rich, flavorful and absolutely delicious. 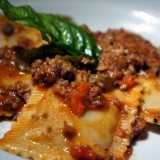 Well prepared, soft yet al dente and served with a rich meat sauce. Layers of flavor are deep and rich. Tender, melt-in-your-mouth goodness. 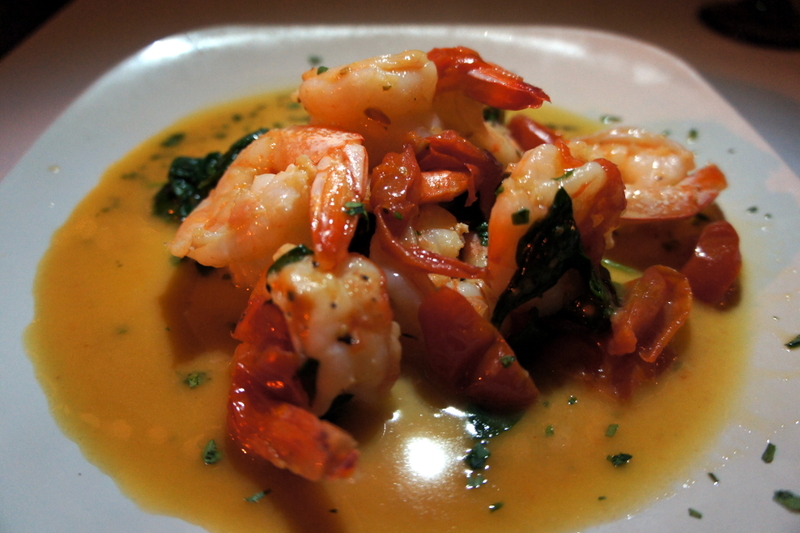 Very nice presentation, and a generous portion of shrimp … eight! The sweet tomatoes and fresh spinach created a light, flavorful dish. The portion was a good size, and the fish was fresh, sweet and complemented by the tangy lemon. 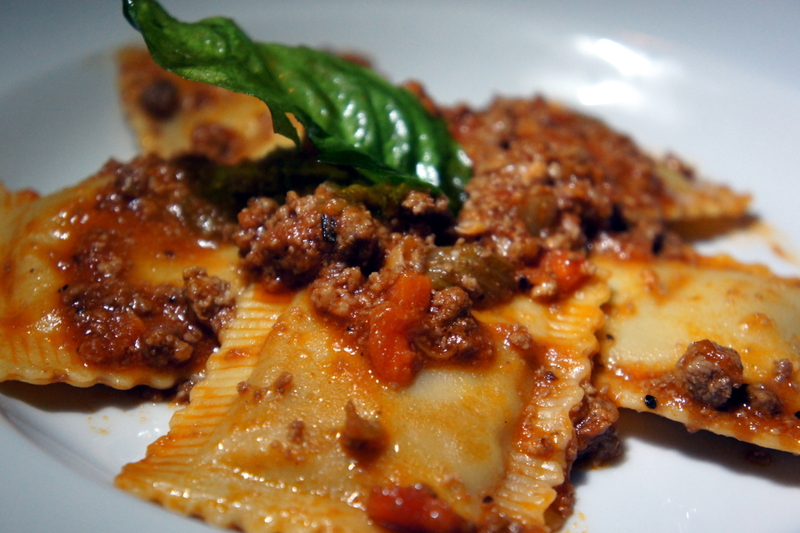 The side of pasta was al dente, just the way we like it. Truffled Allen Brothers Steak: Ask about the cut and preparation of the day. Served with mushroom, risotto and the vegetable of the day. $41.95. 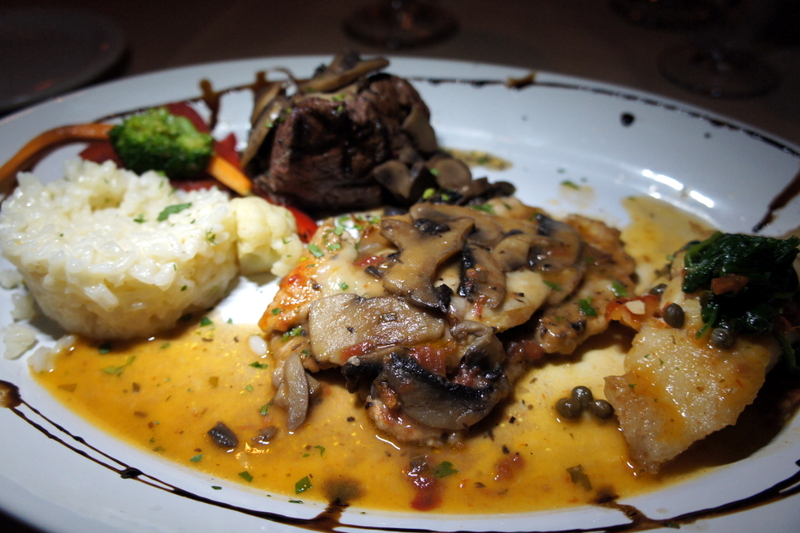 Rich and tender, this fillet was melt-in-your-mouth delicious. We had locally caught red grouper prepared with sun dried tomatoes, spinach and capers in a white wine sauce. Creamy, sweet, luscious and homemade. Need I say more? A nice flaky and crunchy shell filled with an ever-so-slightly sweet cream. Perhaps one of the greatest combinations known to man: chocolate and pasta. Can you imagine? It was outstanding. In addition to their extensive wine list, Café Gabbiano also offers full bar service for pre or post dinner cocktails. The waitstaff is very friendly, attentive and accommodating. On one occasion, we had a slightly longer-than-expected wait for the food, but the staff responded very professionally. Café Gabbiano is not your everyday dining spot. The food, wine, and setting are special. It’s the perfect place to celebrate with a nice bottle of wine and some great food. I am not sure if good food makes wine taste better, or if good wine makes food taste better. Whatever the case, Café Gabbiano has both! First Friday of the Month: Complimentary wine tasting. “Siesta Hour”: 5:00-6:30pm, $5 drinks and appetizers. Late Night Happy Hour: 9:00-10:00pm.